Home › WWWS › Vaudeville online! Ladies and gentlemen, live from the great, gilded theaters of vaudeville and my own computer, hear authentic acts! Thrill to the song, the comedy, the gripping (sort of) drama of yesteryear! All free, all perfectly pure for the most delicate of sensibilities. I am researching vaudeville for my next book, mandating (myself) 500 words/day, and discovering amazing things. Like . . . the great, the spectacular impresario Benjamin Franklin Keith, father of American Vaudeville. More on Maestro Keith in another blog. 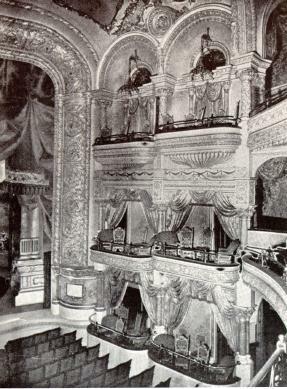 Here’s what you’d find in his Boston New Theatre: elaborate wrought iron decorations, stained glass, incandescent (yes!!) lighting, gargoyles and marble pillars, burnished brass, leather upholstered furniture, enormous paintings by the “eminent artist Tojetti,” a gilded proscenium arch, ornate white and gold balconies, twelve private boxes and walls in brocaded silk effect, hand-painted ceiling. And more: “the finest toilet and retiring rooms in the country,” fragrant floral displays, free gold pens with sterling silver handles, monogrammed paper and envelopes. In the boiler room, yes, ladies and gentlemen, thick carpets and a whitewashed coal bin. Next time you go to a Multi-plex, look around, compare and contrast, ladies and gentlemen.